MANHATTAN — A worker was killed and another injured Tuesday evening when massive pieces of a crane came crashing down at the MTA's No. 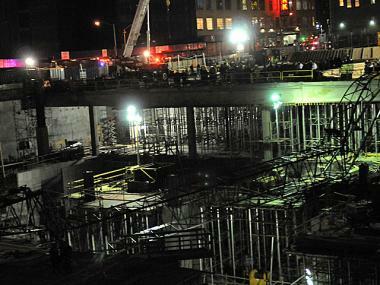 7 extension construction site on 34th Street, FDNY officials said. The 40- and 80-foot sections of the giant machine — which had a 170-foot-long boom — fell to the ground shortly after 7:20 p.m. with a deafening impact at the site on 34th Street and 11th Avenue, fire officials said. Michael Simmermeyer, 30, of Burlington, N.J., was killed in the crash, police said. He was taken to Bellevue Hospital in cardiac arrest and pronounced dead. The other worker, a 48-year-old man, was taken to Bellevue Hospital and is listed in stable condition with a leg injury, police said. 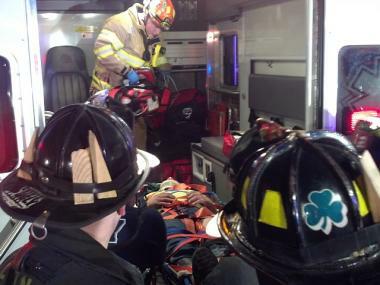 A victim of the crane collapse at 34th Street an 11th Avenue is loaded into an ambulance on April 3, 2012. It was unclear whether the workers were hit by the crane itself or debris, fire officials said. "You couldn't hear anything else, it was so loud," said Kennon Murphy, 49, who had just left the Javits Center, where he was setting up for the car show, when the accident occurred. "That was crazy. I hate to see something like that happen." A worker, who declined to give his name, said he saw the boom split when a cable that connected it to the body of the crane snapped. "The cable snapped and the crane boom went down," said the worker. "These cables hold the boom up and keep it from going down." FDNY Deputy Chief Bill Seelig said the accident was most likely caused by a snapped cable but was unable to confirm that immediately. According to fire officials, the workers had to be pulled from a hole in the ground, making the rescue operation very difficult. 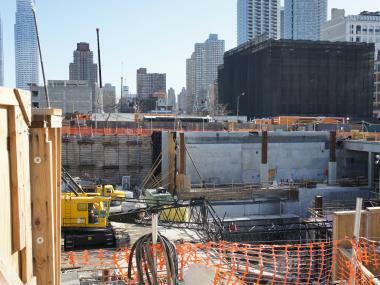 The crane itself was operating 60-feet below ground level at the site, near where the MTA is construction a station for the extension of the 7 line to the Hudson Yards area. "The people who were injured were 60 feet down in the pit," said Chief Seelig. "So, it wasn't an easy removal. It was a complicated job because it wasn't at ground level." Rescue workers had to use a rope system to lift the victims out of the construction site, he explained. The crane's two operators were left in shock by the incident and were also taken to Bellevue Hospital, officials said. One worker at the site said at least two of the victims were part of the Building, Concrete, Excavating & Common Laborers Union, Local 731. NYPD detectives were on the site interviewing workers, but police officials said there was no indication of wrongdoing or negligence. Part of the crane that came crashing down at the can be seen in the right foreground. Work on the $2 billion 7 train extension project, which is set to be completed in 2013, entered its final phase last September. "On behalf of the entire MTA, we pray for the recovery of the workers injured as a result of this tragic accident tonight," the agency said in a statement. "We will work together with all proper authorities to conduct a thorough investigation on the circumstances behind this unfortunate incident."